Mummy and Wooden Coffin Base. Abydos, Egypt. Egyptian. Old Kingdom, Dynasty 6, 2305-2152 BC. Linen, human remains, wood, modern head rest. Collected by William A. Shelton, funded by John A. Manget. Photo by Emory Photo/Video. In 1921, William Arthur Shelton, a professor in Emory's Candler School of Theology, purchased an Old Kingdom mummy from the sacred site of Abydos in Middle Egypt. 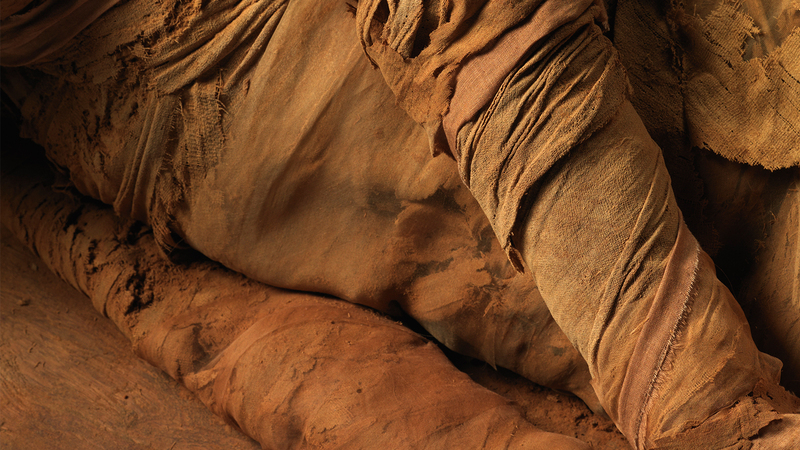 In storage at the Carlos Museum for more than 90 years, its linen in tatters, its head in a separate box, and many bones missing or exposed, the mummy provided an extraordinary challenge for conservators Renee Stein and Mimi Leveque. This video documents their almost year-long treatment of the mummy in close consultation with former curator Peter Lacovara, students and faculty at Emory University, doctors at Emory Hospital, and other consultants. Sharing the stories of civilization.